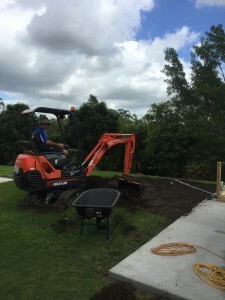 At Inside Out Handyman, there is such a variety of jobs we can do. Every week offers different jobs, meeting new clients and leaving jobs with very happy customers. At this particular job, the customers sat eagerly waiting and watching as the job was slowly completed! This job took place in Warner, North Brisbane where we installed a Cubbyhouse, called ‘Harry’s Hideout Cubby House’ supplied by Kitcraft. This Cubbyhouse has a house, a fort and a walk way between. 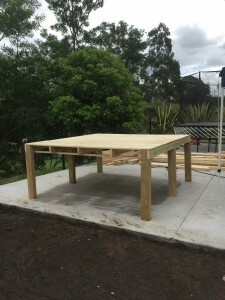 So, up went the platform for the elevation of the house. At the end of ‘day one’ the house part of the Harry’s Hideout was almost ready for a tea party! Matt and Sam were ready to call it a day and were packing away their tools when the ‘Clients’ who had been watching in deck chairs, since arriving home from school, pleaded with Matt and Sam to attach the slide before they left. Matt and Sam both have children of their own and could not walk away from such excited children! So on went the slide! Day two and up went the fort and the walk way between……..
Next, on went all the bells and whistles! The rock climbing wall, handles, steering wheel, telescopes, steps and the sandpit underneath…….. The children were very happy with the end result! The sand pit occupies the area under the house, will soon be full of sand and synthetic grass will be laid under the cubby in the near future. 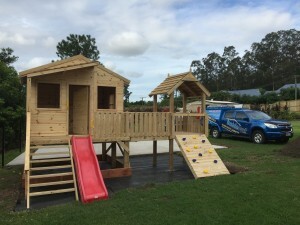 Matt and Sam enjoyed building this project – seeing the children enjoying the end result, was priceless. 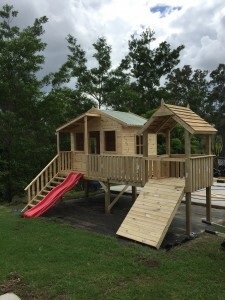 We highly recommend Kitcraft cubbyhouses, as they are made from quality materials and are built to last. A great way to get your children outside to have some fun in the fresh air and using there imagination. 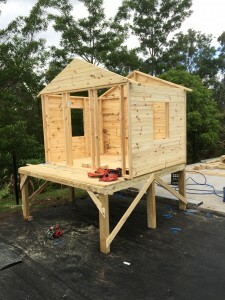 If you have a Cubbyhouse you need installed, please contact us to discuss your requirement.